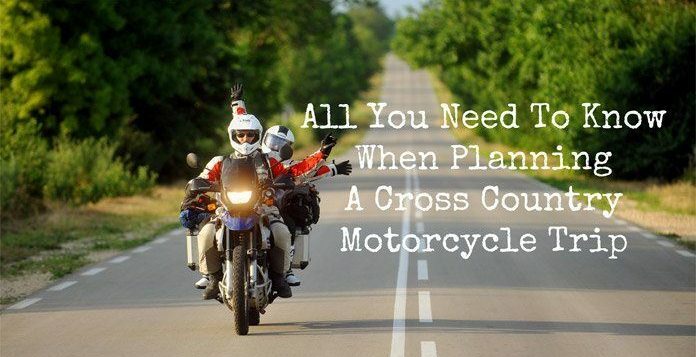 Are you planning a cross country motorcycle trip? Then you are certainly in the right place. In this guide, you will learn all that pertains to cross-country excursions, what you need to do beforehand, how to handle any difficulties you might encounter along the way, and how to have fun while you are at it. That said, crisscrossing the country on a bike is a dream that almost every rider has. There’s just something uniquely romantic about traversing the vast expanses of a great and glorious land on two wheels. Perhaps, it could be the fact that a cross country motorcycle trip is challenging given the level of stamina and resilience that would be required. Alternatively, it might revolve around the fact that bike trips are so affordable. Whatever it is, you can be sure that you are going to have the time of your life while you are at it. Do you have a bike to traverse the country on, or will you be renting/borrowing one? How do you place to get back home once you are done with the trip? What do you need to bring and what you should leave at home? Which route will you follow? How long will the cross country motorcycle trip take? Summed up, making a trip across the country is fantastic and adventurous. It will end up giving you a unique opportunity to enjoy the people, sounds, sights, and cultures all over the country in ways you would never have been able to do otherwise. Further, the trip will store up stories that you can later narrate to your children and their children after them for many years to come. The first step, of course, is to have and to set priorities. As a biker, there are certainly some roads you are going to want to ride on, places you would like to see, landscapes you yearn to experience, and people you must see along the way. One good way to plan your trip is to brainstorm about all the potential goals of your trip. Write everything down, then make a priority list with 5 points detailing the most important to do and to see activities. Next, plot all these priority items on the map you will be carrying. By so doing, you will be better placed to formulate a workable plan for your trip. Next up, you’ll need to prepare for the trip around the country. Apart from planning out your route and mapping the key points to visit, it is vital that you also prep yourself and your motorbike for the thousands of miles you are going to travel. First, consider the unexpected occurrences that might go wrong on your cross-country motorcycle trip. Remember that you will be in unfamiliar territory; therefore brace yourself for just about anything. If possible, you might want to travel with at least one other rider – but never more than 2 or 3 others. After all, managing the proclivities and desires of many riders might prove to be a burden in and of itself. As long you are well prepared for anything, and you decide to go with people you’ve ridden alongside in the past, then you should have no cause to worry. It especially helps if you managed to get people with similar touring priorities – and who have compatible riding styles and personalities. That said, you MUST ensure that the bike you will be using is in top condition before you set out on your adventures. If you are going to need any service – such as an oil change or new tires – along the way, ensure that you have arranged for this before leaving. Of course, it also makes sense to carry a few spare parts and tools that you might end up needing should you get a breakdown. A cell phone and a credit card are other must-haves on such a trip. As a seasoned bike traveler, try not to pack too much clothing, gear, and any other device that you won’t need. For instance, you can handle laundry when you are resting – meaning you certainly won’t need clean clothes for each day of your trip. In case you will be traveling in a pair, don’t instruct them on what to carry. A better alternative would be to provide them with a tank bag or a bag liner where they can put whatever they wish to take. The golden rule in all this: just carry what you need. Nothing more. Nothing less. In the same way, it is necessary that you allocate adequate time for the trip. The country offers tons of fascinating experience and sites just waiting for you to come exploring. When you plot out a cross country motorcycle trip, therefore, you are going to end up experiencing all 5 of your senses – creating lasting and vivid memories in the process. Therefore, you should expect to spend at least 2 to 3 weeks for a one-way trip from coast to coast. That said, the travel times will depend on such factors as the duration and number of stops, the types of roads you’ll be on, and the route you will take. For a more fulfilling experience, however, you’d be best advised to take the roads less traveled. These, of course, will require more time. In your planning, also, ensure that you factor in your return trip. After a couple of weeks on the road riding a motorcycle, you certainly might not be braced for another 3500-4000 miles back home. As a result, most riders arrange for their motorcycles to get shipped back home from their final destination. Over and above everything, remember that you need a minimum of two weeks for a fun-filled, stress-free cross country trip. It goes without saying that you must plan your route. This plan will largely be determined by the priorities you set earlier. For instance, if you wish to ride the historic Route 66 end to end, then you are going to have to allocate a particular slot of time for that. One of the best tips would be to identify every overnight location and secure hotel reservations in advance. If, however, you won’t be making reservations, a good strategy would be to start every day early and quit riding around 3 to 4 pm – before most accommodations get taken up by others on the road. Another matter to keep in mind is the direction you will follow: south versus north and west versus east. While this will mostly depend on your personal preferences, going east to west comes with some advantages; chiefly in the sense that you’ll be able to follow the westward expansion from the East Coast (which is densely populated) to the sparsely populated – albeit dramatic landscapes – West. Although plans are good and all, trips hardly ever follow a strictly laid out plan. For instance, if you travel across the Midwest in summer or spring, there’s always the chance of severe and violent storms. Therefore, you must stay appraised of changing weather conditions and forecasts, so you know how to find shelter when you are caught up in a storm. Remember, riding through thunderstorms is not only bad, it is also dangerous and unnecessary. Still on the same, traveling in a group can prove stressful. Therefore, you need to keep in constant communication with your riding partners. Similarly, remain flexible with your itinerary to ensure that everyone is on the same page, enjoys the cross country trip, and avoids disagreements. In case you do decide to go it out alone, ensure that someone knows where you are each and every day. Check in with them at the end of the day and inform them that you are okay. Another thing you must take into consideration: stops. You will certainly have to take frequent pauses along your cross country motorcycle trip – for gas, for rest, or to simply locate your route. In case you end up in desolate places, it is highly unlikely that your Google Maps will be up to date with open places and hours of operation. If there are chances that you might be pushing the range or another person’s tank, the best thing to do would be to call ahead – if only to be safe. Further, you might want to carry a spare tank of gas if you do have the room. Where possible, spend some time reading through ride reviews and reports on Yelp. Ask friends for a couple of recommendations about different bars and restaurants that will be near your destinations and stopovers. If you wish to wing it, or if you are good with chain restaurants, then the above step isn’t all too necessary. However, knowing what to expect often leads to a more complete – if not better – experience of the places you will visit. It might even ultimately help you form some of the most lucid of memories for you long into the future. Of course, it makes sense that you should document the experience you had with journal entries and/or photos. By taking the effort, you are going to pay tons of dividends in the long run. There is nothing quite as fulfilling as going through photos, videos, and written narratives deep in the future when you are no longer able to take a random cross country motorcycle trip. By so doing, you will be able to relieve your experience over and over again – alone, with friends, or with family. Last but not least, learn how to embrace everything local on your motorcycle trips across the country. Nothing quite cuts the biscuit than engaging with locals whenever you make a stop. Therefore, you should polish up on your communication skills and be willing to meet up with people. The talks you’ll end up having with them will make for a genuinely meaningful experience overall. To this end, be sure to get local opinions on where they like eating, drinking, and making merry. Instead of relying on Lonely Planet travel books, focus on doing things the local way. A good tip would be to get the ball right and rolling by picking up local newspapers the moment you drive into town. Check through it and find any events that coincide with the time you are there. Then, go out there and see, feel, and experience the scenes. Over and above everything else, cross country motorcycle trips are worth a dime and more. The experiences, feelings, places, people, and sights you will encounter will form beautiful memories for you. What is more, you are going to gain more perspective, soundness of mind, and a general knowledge of our great country in its vast splendor than you would ever have been able to do on any other sort of trip. Get started today and watch as your life is transformed from mundane existence into something a bit more exciting by taking a trip around the country.